Every time I step into Primark, I somehow end up being in there for about two hours and come out with several of the giant brown paper carrier bags! 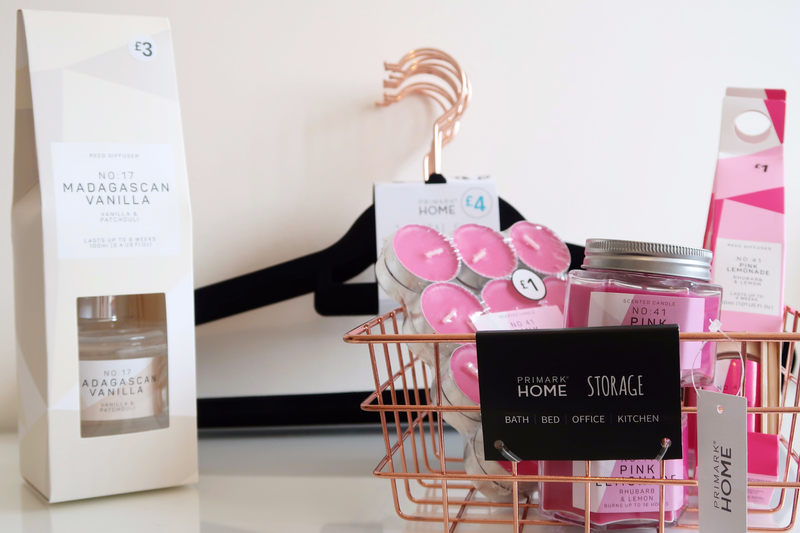 I thought I'd show you some of the things I picked up from the home section recently, along with a couple of beauty products thrown in. 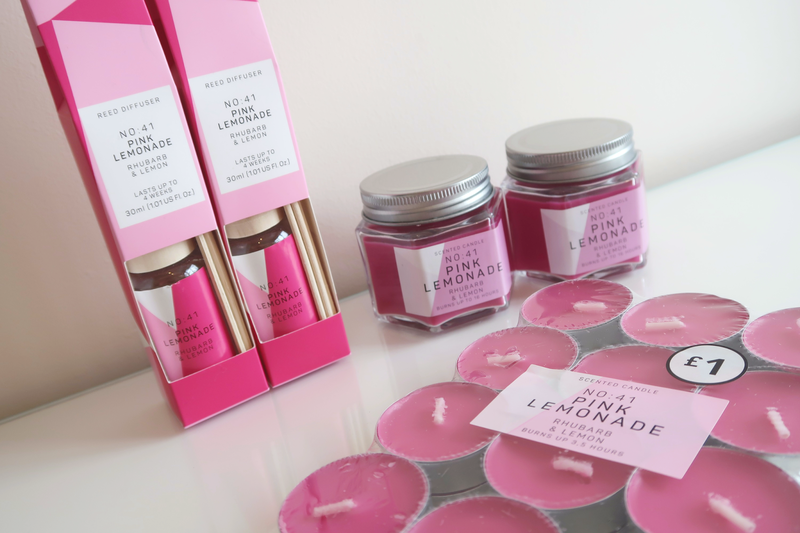 If you love rhubarb scented things, you NEED to smell the Pink Lemonade range of home fragrance items. The candles, diffusers and tealights were all just £1 each so I stocked up. The scent of rhubarb and lemon together is amazing. I love it! I think I'll keep these in my beauty room so I can smell it while I'm getting ready. I decided to pick up a slightly more sophisticated diffuser to go in the main bedroom. 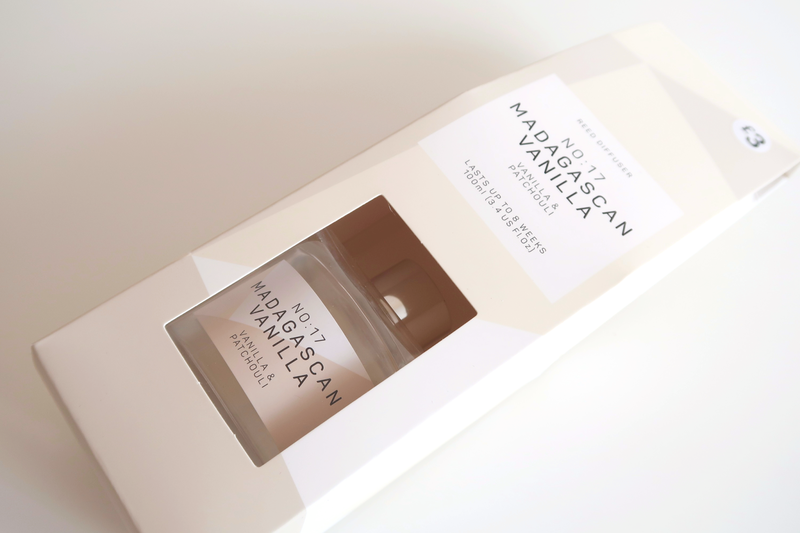 I thought Madagascan Vanilla sounded nice and it was only £3. I kind of have a thing for rose gold items so I had to pick up some more of the storage baskets. They are only £3 each, which I think is an absolute bargain. I already had three in my beauty room to store makeup palettes in so decided I needed another three, you know, just to round it up to an even number. Or some excuse like that. I really don't need any excuse to buy any more rose gold. 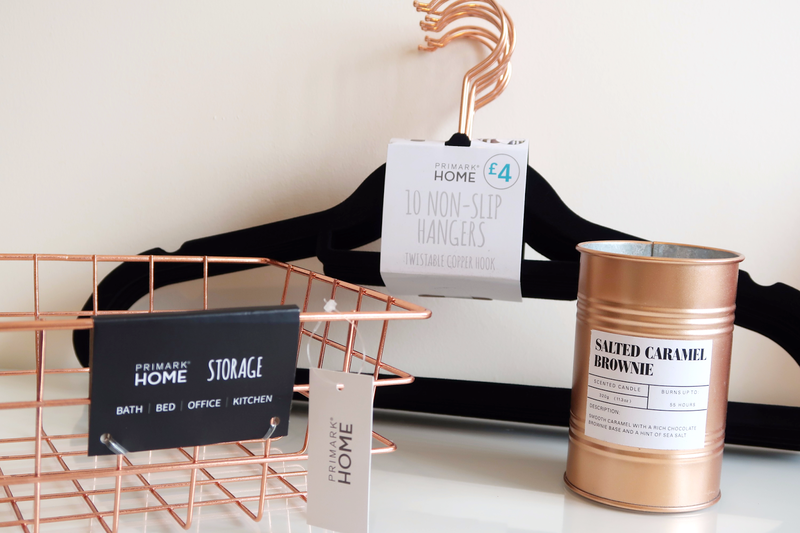 The faux-suede black and rose gold hangers, whilst another bargain at ten for £4, were actually on offer for just £3 so I bought three packs of those as I fancied having a bit of uniformity in my wardrobe instead of all the random mismatched hangers I've collected over the years. I spotted the Salted Caramel Brownie candle in a random place as someone had abandoned it so I quickly snapped it up. This was £4 but I really love the design of it and it smells delicious too. There seemed to be a section of Jo Malone style fragranced products such as perfume, hand wash, body lotion and hand creams so I had a browse of those. 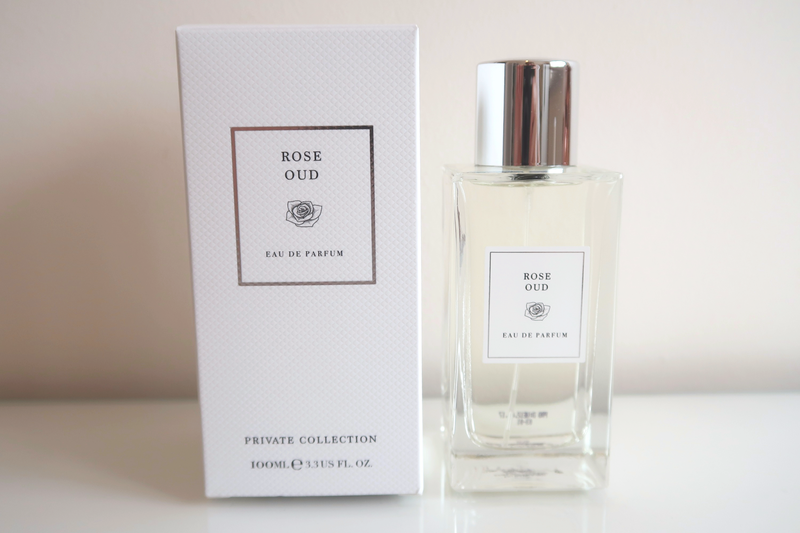 I then spotted the Rose Oud one, which was £8 for 100ml and I loved the scent of it. From what I remember, it does actually smell like the rose and oud intense fragrance at Jo Malone which is over £100 so I decided to try it. I think it will make the perfect winter fragrance. They had smaller purse size fragrances and multipacks with different versions in, if you don't want a huge 100ml bottle. I can't remember the exact fragrances but they were along the lines of pomegranate, mandarin, vanilla and maybe lime. They seemed to be selling out fast so make sure you check those out asap if you're interested! 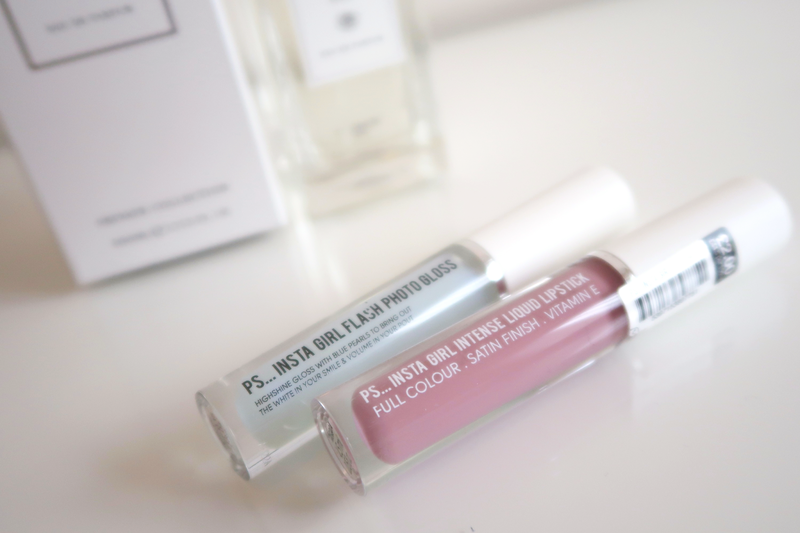 I saw the PS... Insta Girl Flash Photo Gloss, a blue toned lipgloss and it reminded me of a similar one I'd seen by The Estee Edit so I thought I'd give it a go since it was only £2. From the same range, I picked up an Intense Liquid Lipstick to try and I like the colour of it. They had a few other shades so something else to check out next time you're in. They seem to have quite a few impressive looking skincare and makeup products actually. Have you bought anything from Primark lately? Where do you like to buy homewares and accessories from?